Amos Pewter designs and hand-crafts pewter jewelry, ornaments, home decor and collectibles, inspired by nature and our seaside surroundings. Visit our open studios in scenic Mahone Bay, on the historic waterfront in Halifax, picturesque Peggy’s Cove and at lively Peake’s Quay in Charlottetown, P.E.I. Our artisans will show you how molten pewter is cast into sculptures, candle holders, jewelry, collectible ornaments and other keepsakes. Take part in our hands on experience, finish and personalize your own pewter piece! 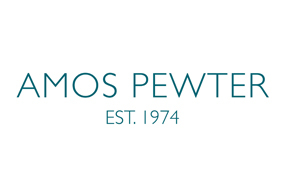 Follow Amos Pewter on Twitter, Facebook, Instagram and Pinterest.